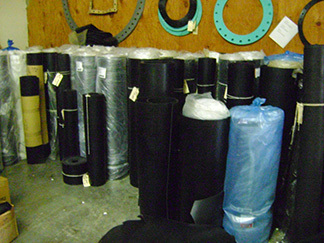 We stock UNAFLEX sheet Neoprene, EPDM, Buna-N ,Cloth Inserted Rubber & Cloth Inserted Neoprene in full or partial rolls. We can supply the following sheet rubber styles from our South San Francisco warehouse in full or partial rolls, cut into strips, or into standard pipe flange gaskets, or fabricated to match your sample or drawing. Plate Finish, Durometer 50-60,	Tensile: 800 psi nom.,Elongation: 400% nom., 20/160°F. Plate Finish, Durometer: 60, Tensile: 1000 psi nom., Elongation 400% nom., 20/160°F.